Have you ever eaten asparagus and noticed that your pee smells - for lack of a better term - funny? If you haven’t noticed this body oddity you’re either not eating enough asparagus – and in my opinion there’s no such thing as too much asparagus – or you might be one of about 75% of people that is missing the olfactory gene that allows you to smell the pungence in your pee after eating asparagus. I guess that means I’m genetically gifted because I can definitely smell a difference in my pee after eating this favorite veggie! No need to be alarmed! The smell is completely normal and harmless. Asparagus contains a unique sulfurous amino acid called mercaptan that, when metabolized, gives off a distinct smell in the urine. This smelly metabolic byproduct is present in everyone’s urine within 20 minutes of eating asparagus…and if you have the special gene you’ll be able to smell it. Oh come on! I know all of you are running out right now to get asparagus to see if you’re a part of the olfactory elite! 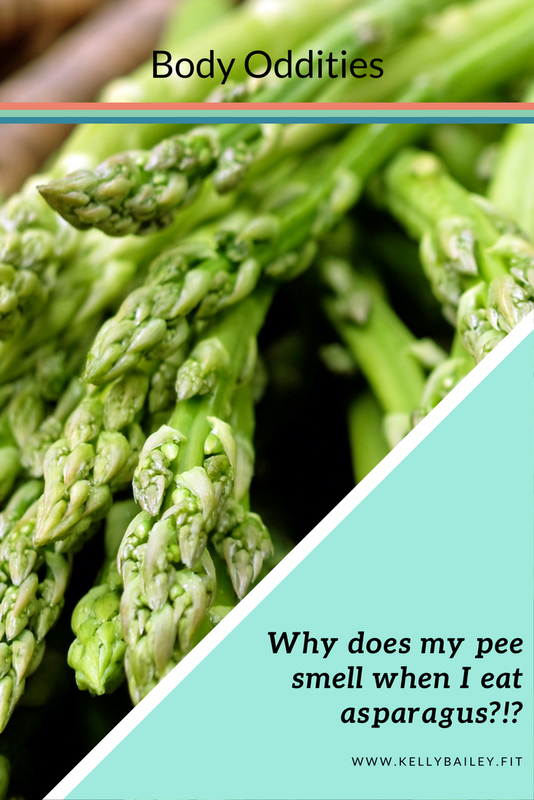 Apart from quenching your curiosity about whether or not you have the special gene that allows you to smell this compound in your pee, you should consider making asparagus a regular on your plate! This versatile and delicious veggie is a powerhouse of nutrition! Asparagus is high in filling fiber and low in calories. Fiber is extremely important for filling our bellies, slowing digestion, and aiding elimination. Eat a hearty helping of asparagus and you’ll fill up faster and feel fuller for longer. Asparagus is loaded with nutrients. I’m a fan of getting vitamins and minerals from whole foods as much as possible. Asparagus is a good source of vitamins A, C, E, and K, thiamine, folate, and chromium. Asparagus is also high in antioxidants which may slow the ageing process…yay to slower ageing! Asparagus is a prebiotic. We’ve all heard about the importance of PRObiotics for health, immunity, and weight management…but have you heard about PREbiotics? You might be wasting your money on expensive probiotic supplements if you’re not feeding the bugs you’re trying to add! Those little guys need to eat too! I call it seed and feed. You seed your gut with a good probiotic and then you must feed them to keep them alive and healthy. Asparagus contains the type of prebiotic fiber your good gut bugs need and love! Asparagus is a natural diuretic. As mentioned above, the fiber in asparagus aids elimination. That is it helps you poop. But it turns out that asparagus also makes you pee which can help rid the body of excess salts and fluid. This is especially helpful for people with edema or high blood pressure. Asparagus is great on its own grilled, baked, or sautéed in butter, and can easily be incorporated into soups, casseroles, and egg dishes. It’s also great raw! Chop it up for a delicious and satisfying crunch in salads or dip raw spears in hummus or guacamole. I buy at least one bunch of asparagus every week for between-meal snacks. Want to try asparagus tonight? Read on for a simple 5-ingredient recipe that my family loves! This recipe has only five ingredients, most of which you probably already have in your cupboard…so no excuses! Give it a try tonight and see who among your family has the “lucky gene”. And who knows…maybe this “experiment” will get your kids to eat a vegetable! Preheat the oven to 425 degrees F and line a baking tray with unbleached parchment paper or aluminum foil (you don’t need to use parchment or foil, but it does help with cleanup). Trim the asparagus (cut off the tough ends) and add to a bowl along with the olive oil. Toss or mix so that the asparagus is well coated. Spread in a single even layer on the baking sheet. Sprinkle salt and pepper over the top. Bake 12 to 15 minutes depending on thickness of the spears (thin spears will take less time, so do be sure to check them while baking). Sprinkle with lemon juice just before serving. Simple, delicious, and healthy! Serve alongside a juicy grilled steak, baked salmon, pan fried chicken, crock pot pork…or just eat all by itself because it’s that good! Do you have the gene? What other body oddities would you like to know about?